Youngsters and the young at heart alike all love the freedom and fun of the neighborhood playground. Unfortunately, many youngsters are injured on those very same playgrounds. While there is no need for panic, there is a necessity in knowing the facts on playground safety. Every year, over two hundred thousand children receive emergency treatment for various playground injuries. Nearly seventy percent of those injuries occur on public playgrounds. Home playgrounds can also be dangerous. Nearly two thirds of play related deaths take place there. Injuries to the head and face account for sixty percent of all injuries to children zero through four. Not surprisingly, swings have the highest number of injuries for children zero through four. Falls to the surface of the playground contribute to seventy percent of all injuries. National Safety Week which takes place from April 21-25, couldn't happen at a better time since seventy one percent of all playground injuries occur between the months of April and September. S is for Supervision: A surprising number of parents wrongly assume that their children are safe at the playground, and as such, don't pay enough attention to what their children are doing, the equipment they are using, and with whom they may be playing. Don't make this mistake. 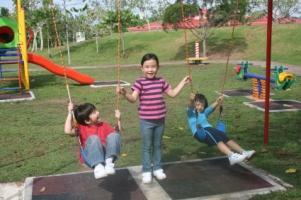 Be vigilant and supervise the movement of your child in play areas at all times. A is for Age Appropriate Equipment: Making sure your child is using age appropriate equipment is key to keeping her or him safe from injury. The bottom line is that children between the ages of two and five do not have the upper body strength, and hand grip size of older children. If you see that your child is playing on equipment that is not suitable for their age, gently guide them away from it. Better yet, play with them on equipment that is age appropriate and have a little bonding time. This way, you both leave the playground happy! F is for Fall Surfacing: While most of us supervise and are mindful about who our children are playing with, few of us may realize how important the surface cover surrounding play equipment, and the playground itself, is. Red flags include, but are not limited to, asphalt, concrete and other similar abrasive materials. If you notice any of these materials, it's best to move your child into a safer zone. E is for Equipment Maintenance: Lastly, you want to take a look at the level of equipment maintenance that goes on at your local playground. Is the equipment well-maintained? Does anything squeak? Is rust readily apparent? Remember, frequent maintenance of play equipment significantly reduces the chances that a child will be injured by one of the play pieces. Similar to fall surfacing, this may not be something that occurs to many of us, but just the same, warrants attention. The numbers can be scary, but preventing injuries on the playground is possible if you have the right facts. While you can't always be Supermom or Superdad, you can be vigilant when it comes to play. And feeling and staying safe always allows for happy play!